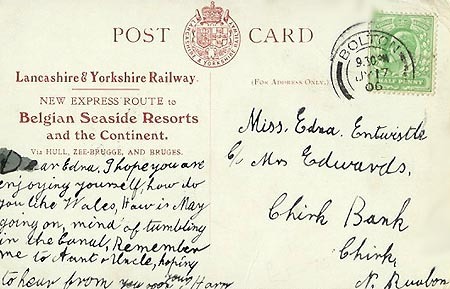 This page is devoted to postcards and photographs of the East Coast services of the Lancashire & Yorkshire Railway (LYR), run by the Goole Shipping Company. LYR West Coast services are shown on LYR - Page 1. An alphabetical list of ships shown on this page is shown below. The Table beneath gives links to complete history pages on selected individual ships. Below the table is a Fleet List in chronological order. 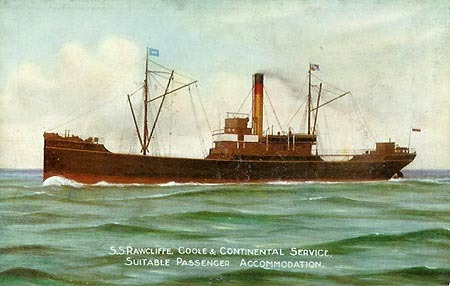 The Goole Shipping Company was formed in 1864, and started carrying passengers in 1879. The first ships were named after directors of the company, of which only the Robert Crake of 1879 survived when they were taken over by the Lancashire & Yorkshire Railway (LYR) in 1905. The Ouse of 1884 initiated the use of northern river names, which were applied to most subsequent newbuildings. In 1895, the Humber SS Co and the Yorkshire Coal & Shipping Co were taken over, adding a total of eight ships to the Goole fleet. 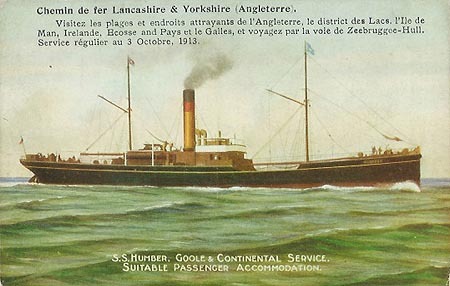 Following the 1905 takeover, the LYR retained the Goole funnel colours of buff with a broad red band below a black top, and the Goole name was retained for use in publicity. Ownership passed to the London & North Western Railway (LNWR) in 1922, and then the London Midland & Scottish Railway (LMS) in 1923. Humber shipping interests of the LMS and London & North Eastern Railway (LNER) were combined into the Associated Humber Lines (AHL) in 1935, although individual companies retained their titles. 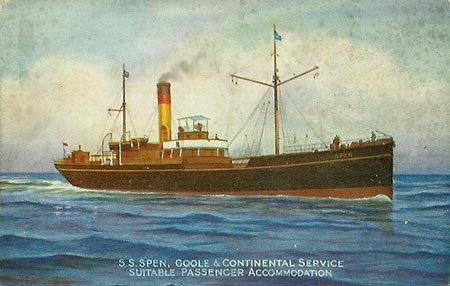 The Goole Shipping Company operated routes from the Humber ports of Goole, Hull and Grimsby to a wide range of European destinations including Amsterdam, Antwerp, Dunkirk, Gent, Zeebrugge, Vlissingen, Hamburg and Rotterdam. 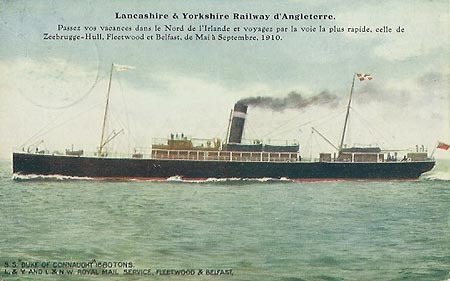 They mainly operated small cargo/passenger steamers, but in 1906, the LYR started a summer service from Hull to Zeebrugge with the Fleetwood steamer Duke of Clarence. 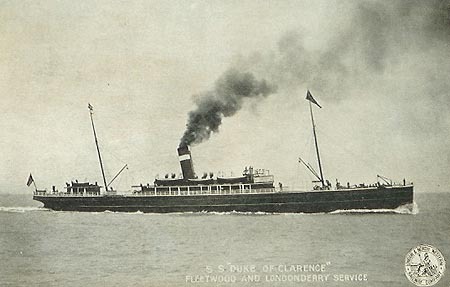 The service resumed after WW1, again with Duke of Clarence, until she was sold for scrap in 1930. For the next four years her place was taken by Duke of Connaught (2). After the formation of AHL in 1935, one of the Humber-based ex-Great Central ships such as Dewsbury operated the service. I also have a Hull-Zeebrugge postcard of Duke of Cornwall, although I have found no records of her sailing on the East Coast so far. Lancashire & Yorkshire Railway - Page 2 - East Coast Services - this page! 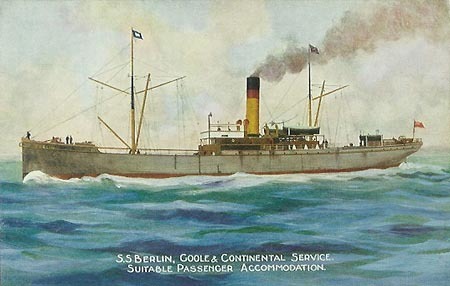 Berlin was one of seven ships taken over with the Yorkshire Coal & SS Co in 1895. The others were Altona (1877), Cuxhaven (1882), Dresden (1884), Emden (1887), and Frankfort (1888). Altona, Emden and Berlin remained in the fleet at the time of the first war, and were renamed River Crake, Wenning and River Ribble respectively. Official LYR postcard of Berlin, with acknowledgement overprint on the back. Berlin was renamed River Ribble during the war. 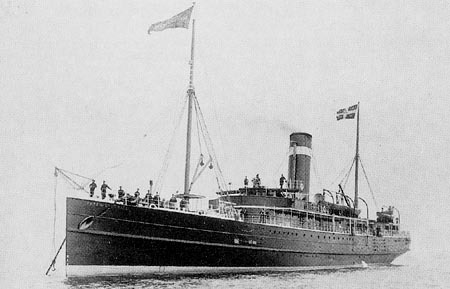 Hebble was built in 1891, with sister Don in 1892, for the Ghent service. Both were lost in the war. Official LYR postcard of Hebble. 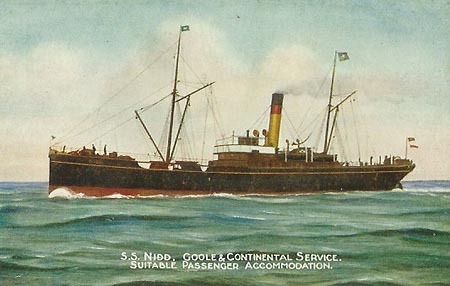 Nidd was built for the Goole Shipping Co in 1900, for the Antwerp service, Her sisters were Humber and Colne. Nidd was built by W.Dobson & Co, and remained in the fleet until 1933. She had been chartered to the GWR in 1932 for Weymouth-Jersey services. Official LYR postcard of Nidd, with acknowledgement overprint on the back. Humber and Colne were sisters of the Nidd of 1900. 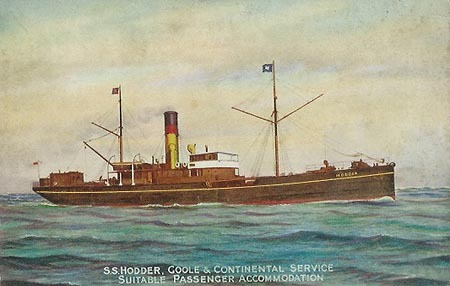 Colne was built for the Copenhagen service, but was deputising for Humber when lost off Rotterdam. Humber was sunk in a collision in 1912. 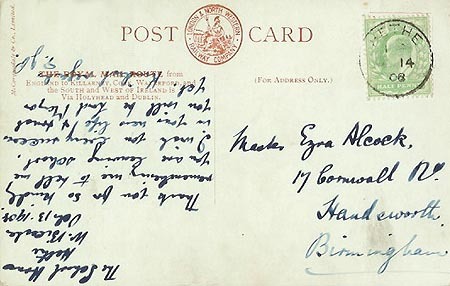 Official LYR postcard of Humber, with French language overprint for 1913 on the front. Humber had been withdrawn in the previous year. The Duke of Clarence was the first of six similar Fleetwood "Dukes" built over a 15 year period. 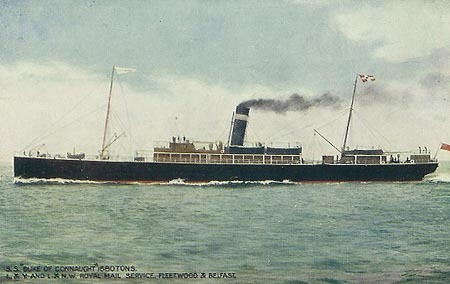 She operated on the Fleetwood-Belfast and Fleetwood-Londonderry routes until 1906. 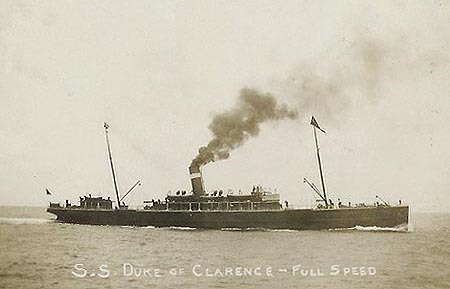 Duke of Clarence was then transferred to the East Coast for summer service between Hull and Zeebrugge, returning to the West Coast each winter. 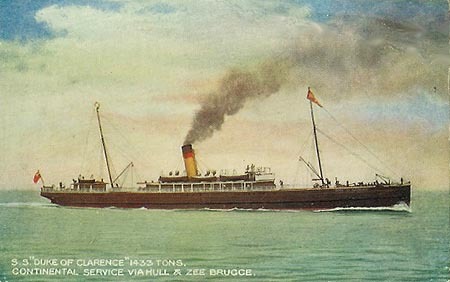 After war service, Duke of Clarence returned to the Hull-Zeebrugge route until 1930, when she was sold for scrap. She was replaced by one of the later Dukes, the Duke of Connaught (2), which continued the service until 1934. 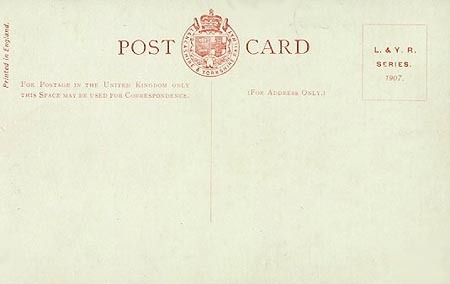 Official LNWR postcard, issued 1904, of Duke of Clarence on Fleetwood-Londonderry service, plus card back. 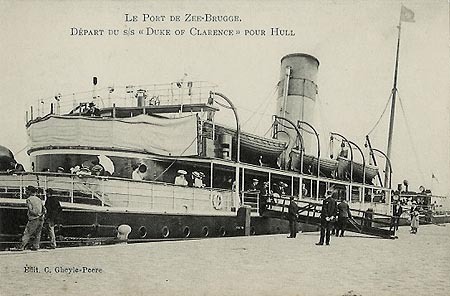 Official LYR postcard of Duke of Clarence on Hull-Zeebrugge summer service, plus card back. 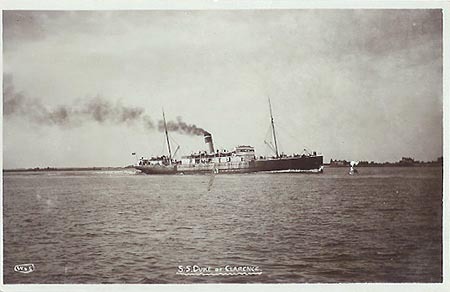 Photographic postcard of Duke of Clarence in LYR service, plus a "straightened" version. Official LYR postcard, issued 1907, of Duke of Clarence with yellow/red funnel on Hull-Zeebrugge summer service, plus card back. 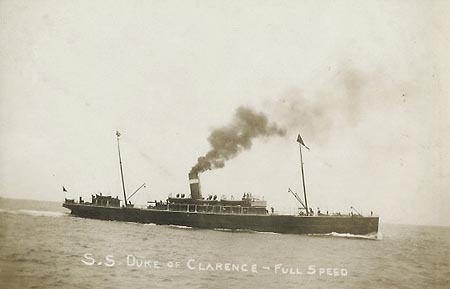 Photographic postcard of Duke of Clarence in the Humber. 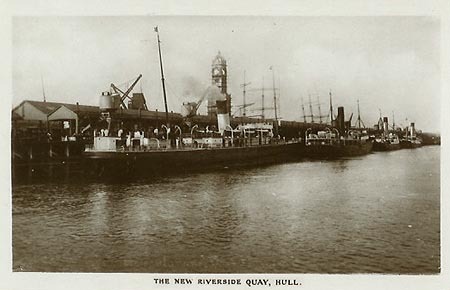 Photographic postcard of Duke of Clarence at Hull, with enlarged view of the ship. 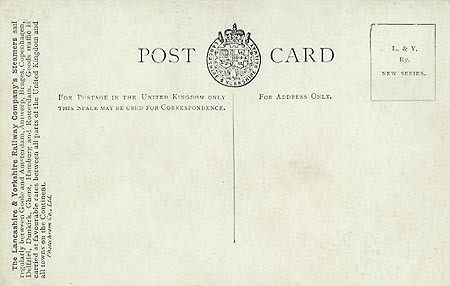 Card was posted in 1924. 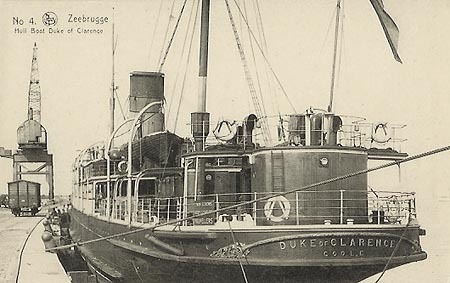 Photographic postcard of Duke of Clarence at Hull. 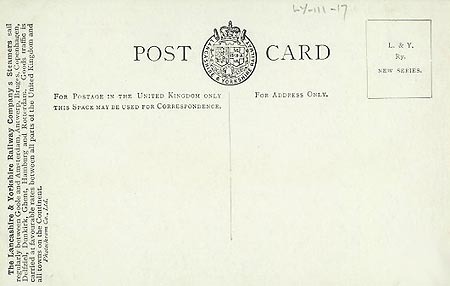 Card was posted in 1914. 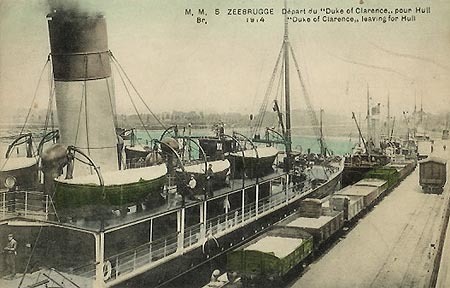 Postcard of Duke of Clarence at Zeebrugge. 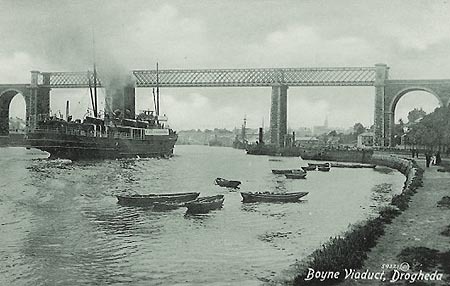 In 1902, the LYR acquired the Drogheda SP Co which operated a passenger/cargo service between Drogheda and Liverpool with four elderly paddle steamers. In 1903, two new screw steamers Mellifont and Colleen Bawn were built for the service, replacing the two of the paddle steamers, Tredagh (1876) and Kathleen Mavourneen (1885), which were scrapped. The remaining two paddle steamers Iverna (1895) and Norah Creina (1878) were retained until 1912. In 1914, the Liverpool-Drogheda passenger service was discontinued, with Mellifont and Colleen Bawn continuing in freight mode only until 1928, when the route was passed to B&I as part of the major restructuring of LMS routes carried out that year. Mellifont and Colleen Bawn then worked as freight ships for the LMS out of Holyhead until scrapped in 1933/1931 respectively. 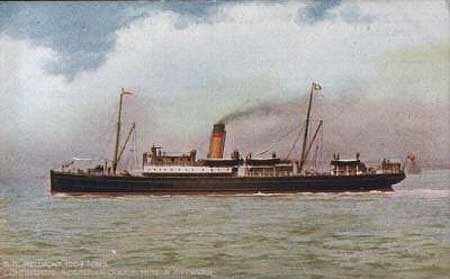 Between 1906 and 1912, Mellifont had served on the East Coast between Hull and Zeebrugge/Antwerp. Postcard of Mellifont or Colleen Bawn at Drogheda. 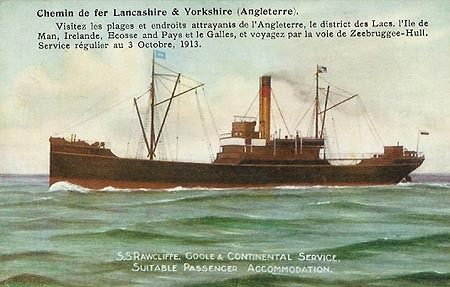 Official LYR postcard of Mellifont with yellow/red funnel on Hull-Zeebrugge/Antwerp service. 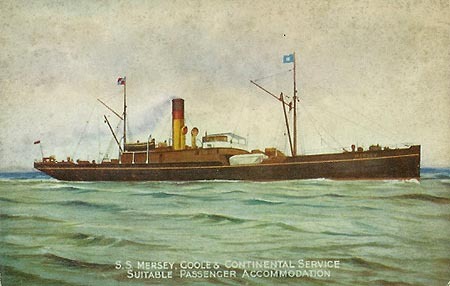 Mersey and Irwell were the first ships ordered by the LYR, after they took over the Goole Shipping Co. They were used on the Goole-Rotterdam routes. Irwell was scrapped in 1954. 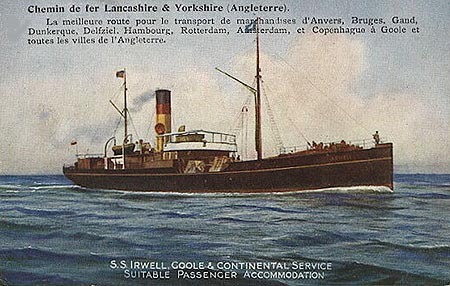 Official LYR postcard of Irwell, with French language overprint on the front. Mersey and Irwell were the first ships ordered by the LYR, after they took over the Goole Shipping Co. They were used on the Goole-Rotterdam routes. 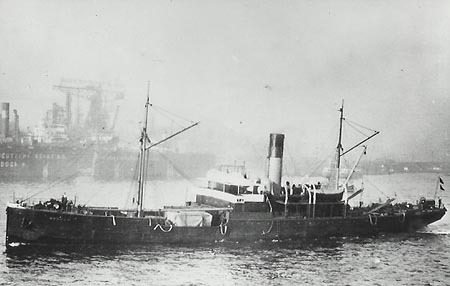 Mersey sank after hitting a mine in 1940. 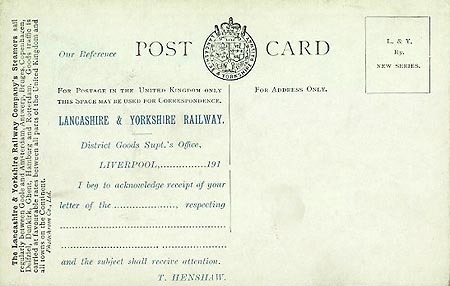 Official LYR postcard of Mersey, with French language overprint on the front. 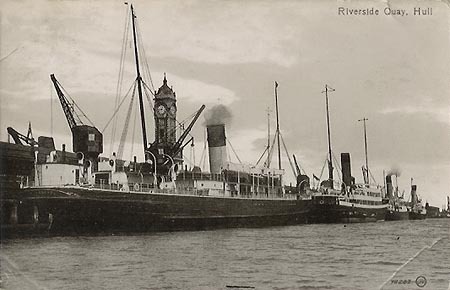 Official LYR postcard of Mersey. 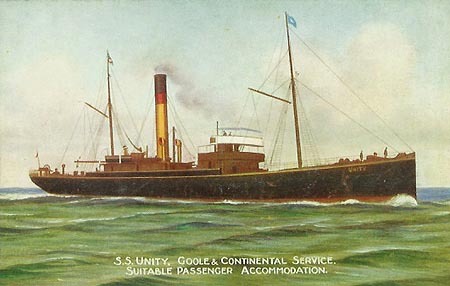 The three steamers Equity, Liberty and Unity were acquired from the Co-Operative Wholesale Society in 1906; they had been built in 1888, 1900 and 1902 respectively for Goole-Hamburg services. 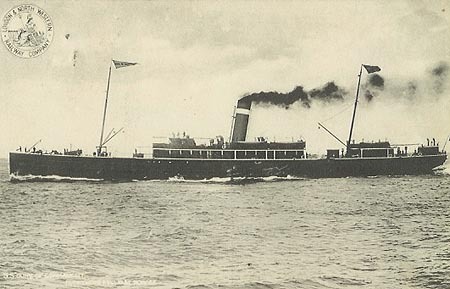 Unity was a war loss in 1918, the others survived until 1932, when they were sold to Italian owners. 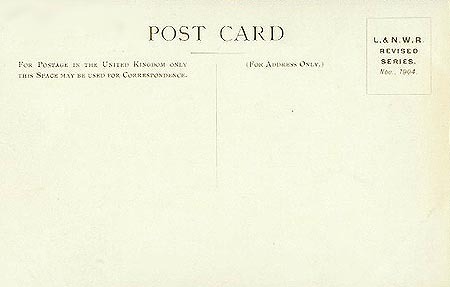 Official LYR postcard of Unity, with acknowledgement overprint on the back. Rawcliffe was purchased from the Wetherall SS Co, in the the year of her building. She was sold by the LMS in 1931. 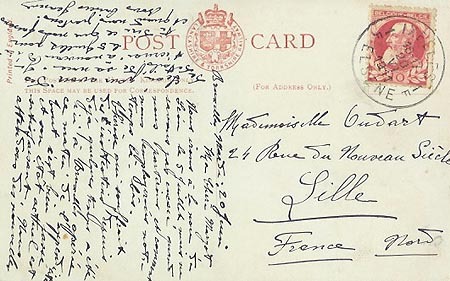 Official LYR postcard of Rawcliffe, with French language overprint for 1913 on the front. 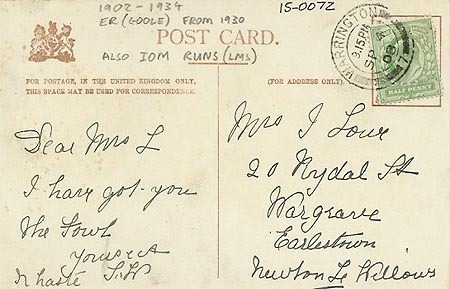 Official LYR postcard of Rawcliffe, with acknowledgement overprint for 1913 on the back. 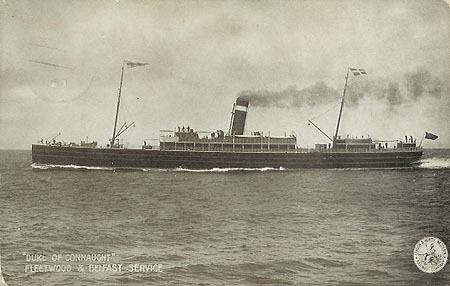 Douglas was built in 1907 for the Copenhagen service. She was refrigerated, and received the pale hull common for refrigerated ships. They were known as "butter boats". She was sold to Greek owners in 1937, and was attacked and sunk off Spain during the Spanish Civil War, although destined for the UK at the time. 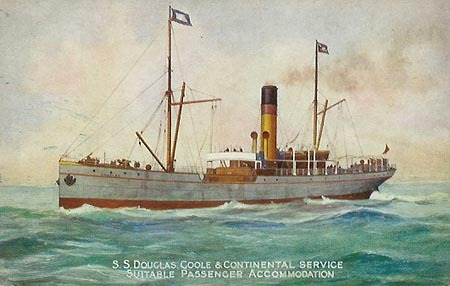 Official LYR postcard of Douglas. Official LYR postcard of Spen. Dearne was the first of ten sisters, six built before the war, and a further four built by the LMS after 1923. Dearne (1) (1909-1915), Hodder (1910-1956), Ouse (2) (1911-1940), Alt (1911-1954), Rother (1914-1956), Rye (1) (1914-1918), Hebble (2) (1924-1957), Rye (2) (1924-1941), Dearne (2) (1924-1957) and Don (2) (1924-1958) . Official LYR postcard of Dearne. 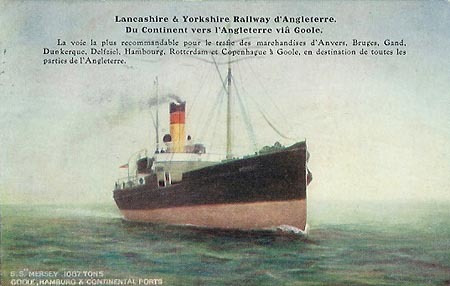 The second of ten sister ships delivered between 1909 and 1924 for the LYR and LMS. See Dearne (1) for a complete list. 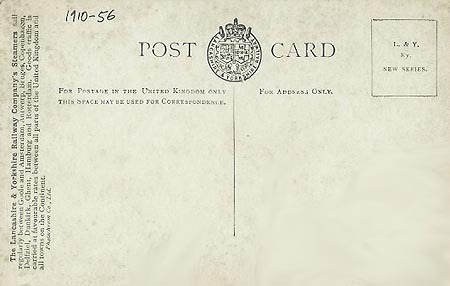 Official LYR postcard of Hodder. Duke of Connaught (2) was built for the joint LYR/LNWR Fleetwood-Belfast service in 1902. 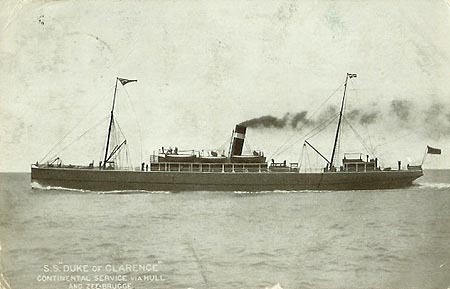 In 1930 she was transferred to the Hull-Zeebrugge service, replacing Duke of Clarence. 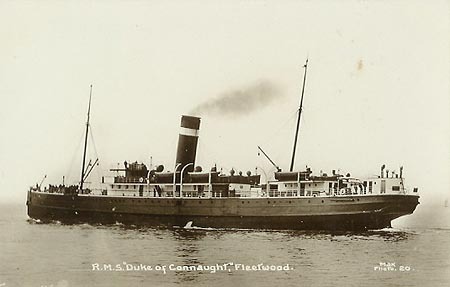 The route remained summer-only, with Duke of Connaught (2) returning to Fleetwood each winter. These journeys were marketed as short cruises - scans of a brochure will be added soon. 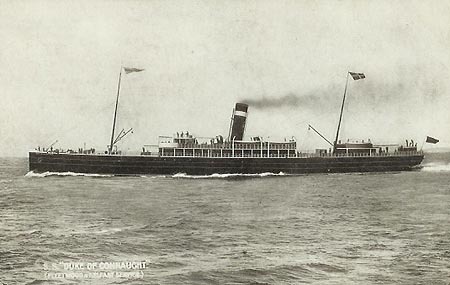 Duke of Connaught (2) was scrapped in 1934. Official LNWR postcard of Duke of Connaught (2) on Fleetwood-Belfast service, plus card back. 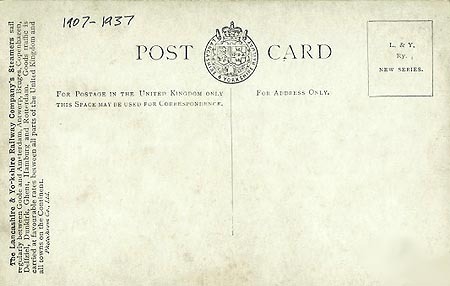 This card has the LNWR emblem at the top left. 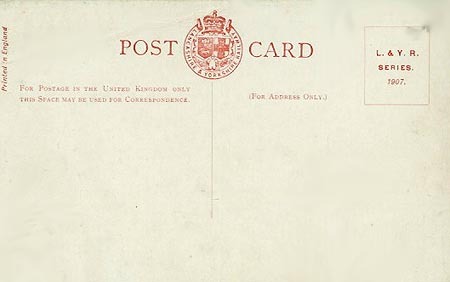 Card posted 1908. This variation has the LNWR emblem at the bottom right. 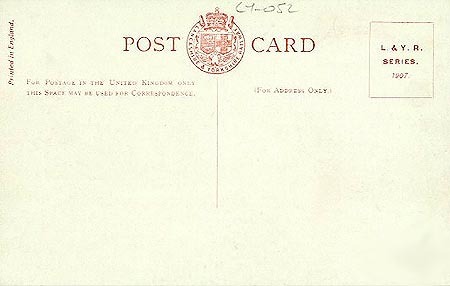 Card posted 1908. This variation has no LNWR emblem. 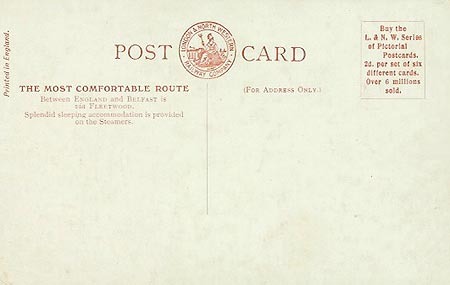 Official LYR postcard, issued 1907, of Duke of Connaught (2) on Fleetwood-Belfast service, plus card back. 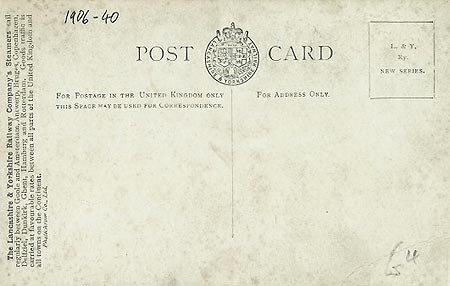 The card has a 1910 overprint in French, advertising through services from the continent. 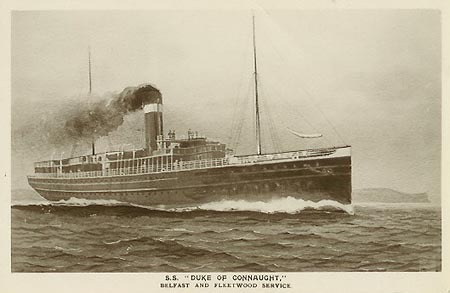 Photographic postcard of Duke of Connaught (2). 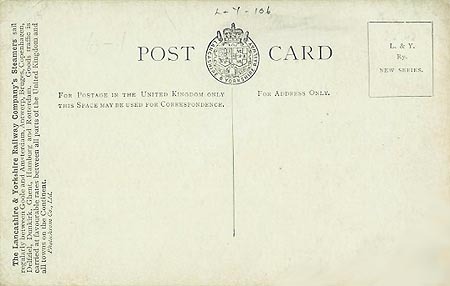 Photographic art postcard of Duke of Connaught (2). Photograph of Duke of Connaught (2) in LMS service at Fleetwood. 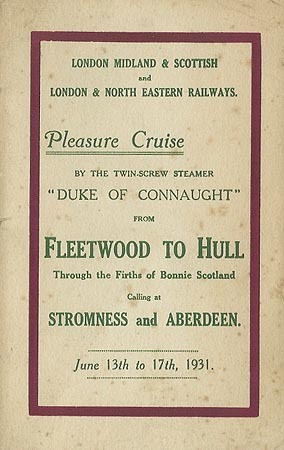 Cover of cruise guide for Duke of Connaught's 1931 positioning cruise from Fleetwood to Hull. Additional scans from this guide will be added later. Duke of Cornwall was built by Vickers for the joint LYR/LNWR Fleetwood-Ireland services in 1898. 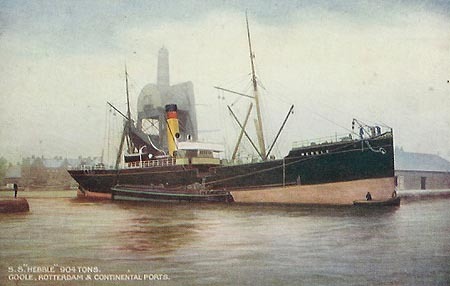 I have a Hull-Zeebrugge postcard of Duke of Cornwall, although none of my books refer to her ever operating on the East Coast. I include it here for completeness. 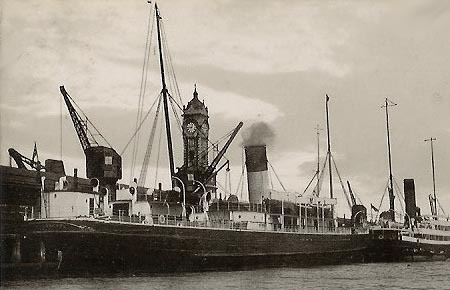 She passed to the LMS in 1923, and was used mainly on Heysham-Douglas sailings. 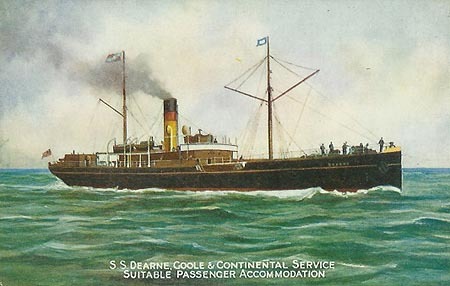 In 1928 the Heysham-Douglas route was passed to the Isle of Man SP Co along with the Duke of Cornwall and Antrim, but not with the third ship used on the route, the Duchess of Devonshire, which was sold foreign. 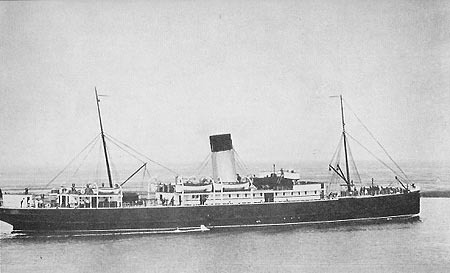 Duke of Cornwall was renamed Rushen Castle by the Isle of Man SP Co and was scrapped in 1948. Vickers photograph of Duke of Cornwall when new. 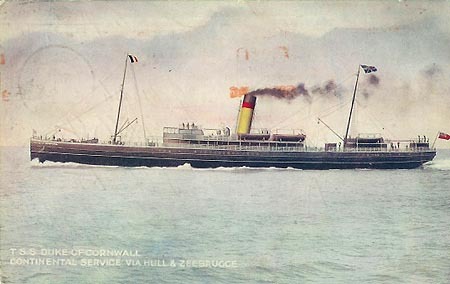 Official postcard of Duke of Cornwall on the Hull-Zeebrugge service, plus card back. 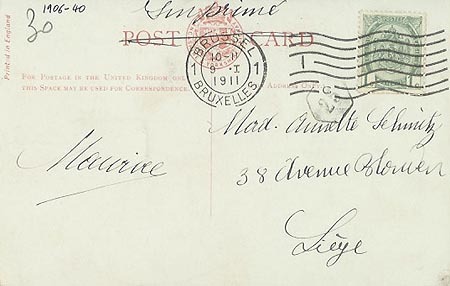 The card was issued by local agents in Belgium, not the LYR. 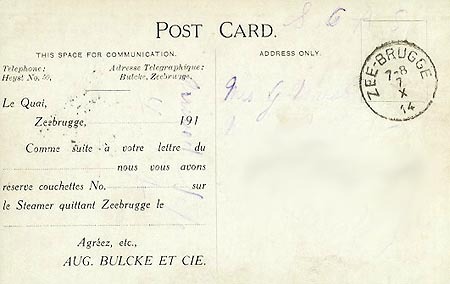 Posted from Zeebrugge in 1914. I have no records of Duke of Cornwall serving on the East Coast.